Welcome back to my blog everyone. I’m always excited with each new release to share my projects and ideas with you all. More often than not it is so hard to sit on projects and wait for them to be released. I wish I could just release as I create stuff but that would probably be overwhelming. I also love our design team and seeing what they create each month because it is often beyond anything I myself would think up. I am fortunate to have an amazing group of talented designers, each with their own unique style that lends different design ideas for just about any style. Today I am going to share a sample using one of our *NEW* cut files! It was based on a quick sketch from an email a few months back from one of our customers Lisa S. I always love being able to accommodate my customers requests. Some are for “general” ideas, such as our Clam-ped Shut this month, and others are more unique. I think this one was fun because Lisa is in the cake pop making buisness, and she attends many craft fairs. She wanted something that could quickly and easily wrap up her simplier cake pops or the candy coated delights she makes. So based on her drawing and ideas for add ons I can up with the simply sweet Pop On Over. 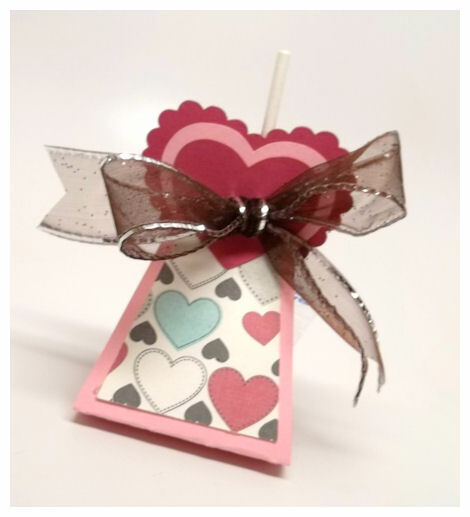 If you love lollipops, then you will really love this fun and fabulous cut file that “pops on over” any lollipop creation! 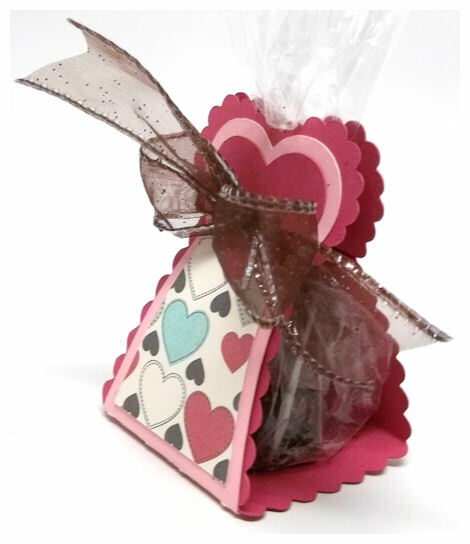 This is a heart topped wrapper that just convey’s LOVE! You can also choose to use the scallop heart layer or not. Just wrap it up, and tie it off! This is the plain version of this Pop On Over cut file. 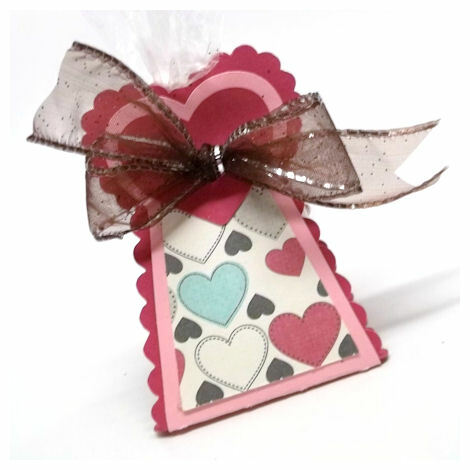 I used a pink cardstock, layered with the cute heart pattern from the Minty Chocolate © collection. Here we have a simple lollipop we got in a mega bag at the store. You can use Blow Pops, Tootsie Pops, Sour Pops etc. It costs just pennies for this! Seriously cute and eyecatching. Just what Lisa S. wanted to dress up her cake pop display to set her apart from the other vendors at a fair or in the stores she sells her pops in. Cake pop creations are on the rise, and fabulous ways to gift them are as well! That being said, who doesn’t love those chocolate versions as well? Notice no stick? Here was have stepped it up a bit, adding the scallop layer to the Pop On Over cut file. 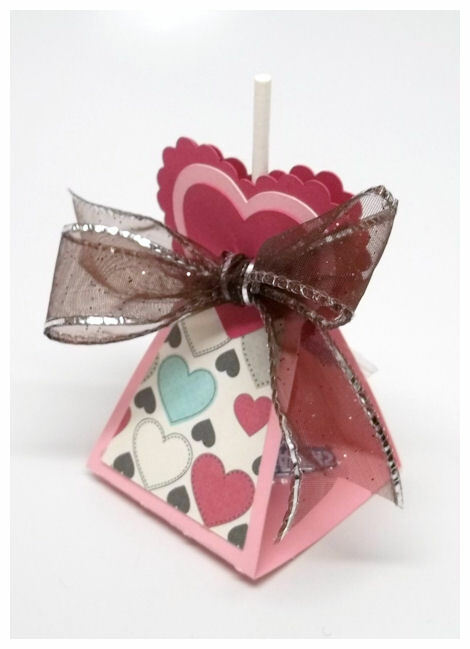 You can also place virtually any item in a plastic bag, then wrap it up with this Pop On Over cut file too! You just pull the top through to the top of the cut file, and tie it closed, as I did here. There are two chocolate truffles wrapped up in here instead! 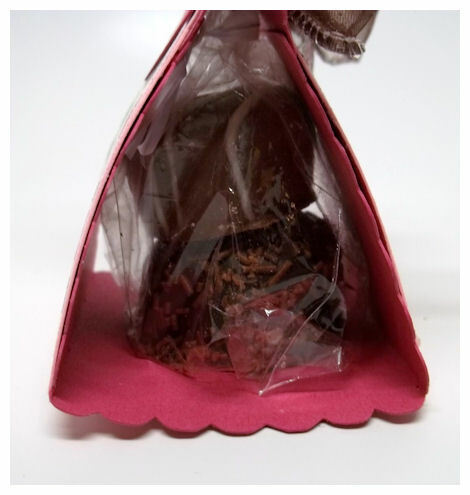 You could use any homemade chocolate, cookie, caramel, candy or how about Dove, Lindt, Godiva etc. Don’t worry if you’re not Suzie Homemaker! That is no problem, because you can use any store bought creations too. 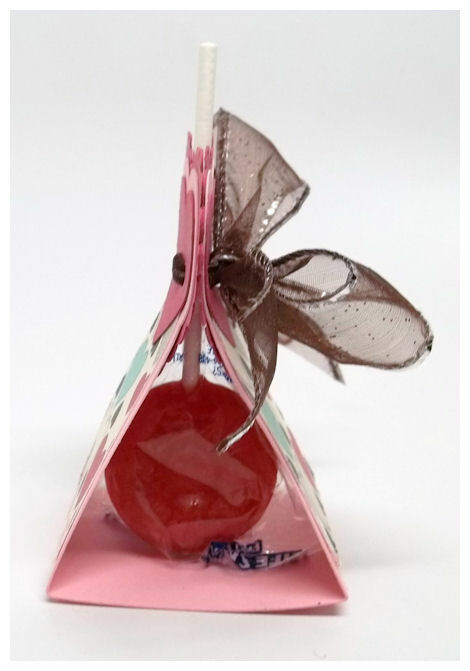 If you are like Lisa S. and many others out there who are making lollipops, or cake pops then you may also want to check out our amazing Sweet Treats Tote, as it includes an insert made just for lollipops (as well as 3 other design options)! I know my own kids will be making cake pops and gifting them this Valentines Day! Amber just got a cake pop maker and chocolate melter. She made some for a kids cookie swap she was in. Too fun! No matter what time of year it is this is definitely something that can be used year round to turn something inexpensive to over the top fabulous!